When I first arrived in Cary, North Carolina about 17 years ago, I was wowed. Beautiful lawns, sign ordinances, bright blue skies, nice cars, you name it. Coming from NY, the grass really was greener on the other side, or at least a different shade of green. While I love everything about the Raleigh / Cary / Apex are, I did notice that Cary in particular was missing 3 things. A pit-smoked BBQ restaurant, an iHOP, and most importantly, a Wegmans grocery store. Wegmans is the best grocery store in the USA. 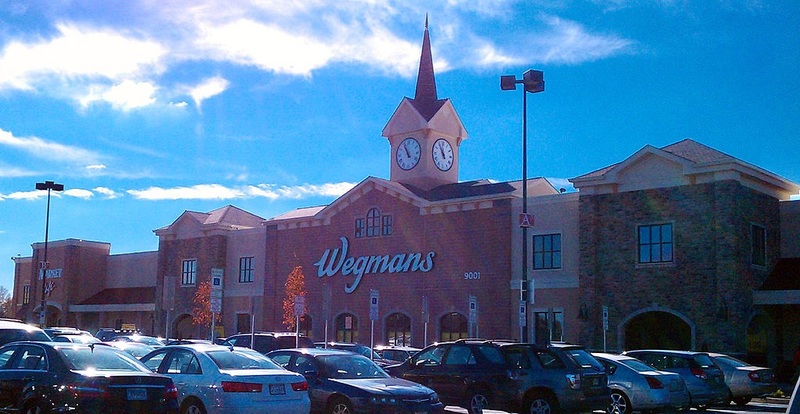 From Buffalo, NY to Philadelphia, PA, there are Wegman’s grocery stores in most every major city. They are also located in Massachusets, NJ, Maryland and Virginia. When there is a Wegmans in town, people don’t say “I’m going to the grocery store”, they say “I’m going to Wegmans”. Founded in 1916 and still privately owned, Wegmans is on Fortune’s top 100 places to work. They were rated the #1 grocery store in the USA in 2015 by Consumer Reports, and this article on BuzzFeed offers some good perspective: 25 reasons Wegman’s is the Greatest Supermarket you will ever know. Most of their smaller stores have been shut down in favor or larger “destinations”. In upstate NY, their mid sized stores are about what you’d expect out of a Harris Teeter. Then in Virginia, they have the massive Wegmans which have about 20 buffets in them. Yes, I said 20 buffets. 20. Buffets. The larger stores have massive candy isles, walk in beer caves, pizza, amazing bread, a bakery, a pharmacy, great food, organic food, vegan food, local food, reasonable prices, a wide variety, their own magazine, recipes, huge selections of cheese, beer, meat, vegetables, and more. They have excellent pizza and great products. Unique bread dips and lemon garlic marinades are at your fingertips, as well as all sorts of unique and delicious foods that you can only find at Wegmans. They even have their own organic research farm. Danny Wegman is the CEO of Wegmans. I met Danny many years ago on one of his visits to a local store in New York. I remember his smile and his car. 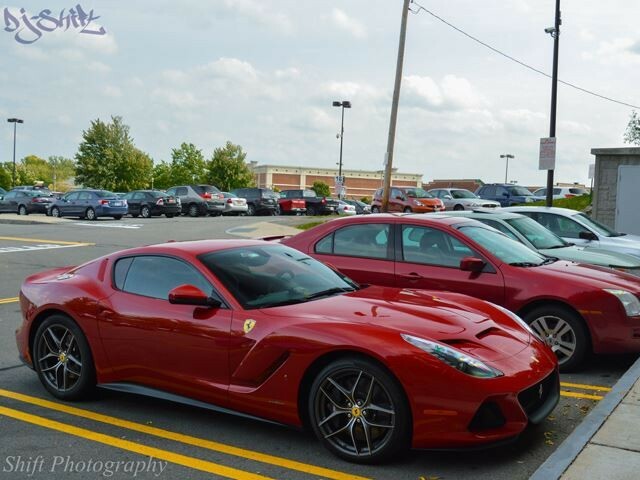 Thanks to this Flickr page I was able to discover that Danny indeed has a Ferrari, and a very unique one at that, it was built just for him, a Ferrari F12 SP America. Of course, there is a lot more to Danny than his car; I just don’t know what it is. I do know that he delivers a promise on each one of Wegmans’ products which guarantees customer satisfaction, which is pretty cool. A personal guarantee from Wegmans’ CEO Danny Wegman. On a recent trip to Washington DC I discovered a Wegmans on my Google Maps app and pulled off. The place was massive; it was like a super-Wegmans. If I recall correctly there was an eating area with about 15 different types of cuisines. I ate, used their huge, clean bathrooms, grabbed a coffee and did some shopping, starting with their amazing bread. I wouldn’t mention their bathrooms but they really are huge and clean. If you’re the type that prefers to go at home you’ll have no problem relaxing in a clean Wegmans bathroom! And chances are, you’ll spend 3 hours here and get to discover this yourself. Is Wegmans a good place to work? As mentioned earlier, Wegmans is one of Fortune Magazine’s top 100 places to work in the USA. While the average base pay is not great for Cary, they offer some amazing benefits, making it a fantastic place to spend some time at. I specifically remember cashiers wearing badges displaying how long they’ve been with the company, who will reimburse you for college tuition, give you paid time off, work with people’s schedules, and offers discounted gym memberships. In other words, yes, Wegmans is an excellent place to work and many people in Cary will be lining up to work there. What about the other grocery stores are in Cary? In Cary we have a Publix, Lowe’s Foods, Harris Teeter, ALDI, Walmart Super Store, The Butcher Block, BJ’s, Trader Joe’s, and more. Then in Raleigh there’s a Costco and nearby in Apex we have a Super Target and a Costco which is scheduled to open in 2016. When I first got here, I learned that CARY stands for C.A.R.Y., the Central Area for Relocating Yankees. Very true. I think there are more New Yorkers in North Carolina than there are in New York! While that is not true, I do believe that there are far more rednecks in NY than there are in the South. If you want to see dirt roads and country livin’ you need to go to upstate New York. Nobody is eating biscuits and they’ve probably never once ever tasted or even heard of “sweet tea”, but trust me on this one. Anyways, when I ended up leaving the country and living in the land of Yankees, Cary, I knew immediately that the place needed Wegmans! NC natives will love it as well I’m sure. In fact, other nearby stores should just go ahead and shut down now! Sorry. Trader Joe’s, Fresh Market and Whole Foods are going to see a serious dent in their business and I would not want to own a Harris Teeter, Kroger, Piggly Wiggly, or a Food Lion within 40 miles of a Wegmans. 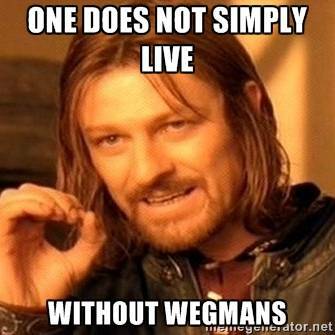 Maybe the other stores are unique enough to survive, but man, Wegmans is the best supermarket in the country, so…. Will the Cary NC Wegmans have the same items as the NY Wegmans? I spoke to some friends today and they told me their favorite items are the pumpernickle bread and beef dip, the Hoffman’s coneys, salt potatoes, Dinosaur BBQ sauce, and the beer. From what I saw in VA I am fairly confident predicting that many of the items sold in the Cary Wegmans will be unique to our area. Maybe Cackalacky sauce will be here and the potatoes will be unique to the NY stores. Time will tell. On January 20, 2016, I drove by the future Wegmans location to get a picture for this post. It was freezing, so I took it from my truck while I was driving by. It just so happened that ABC11 had the same idea as me and Elaina Athans was there reporting. She is braver than I and got out of her vehicle. 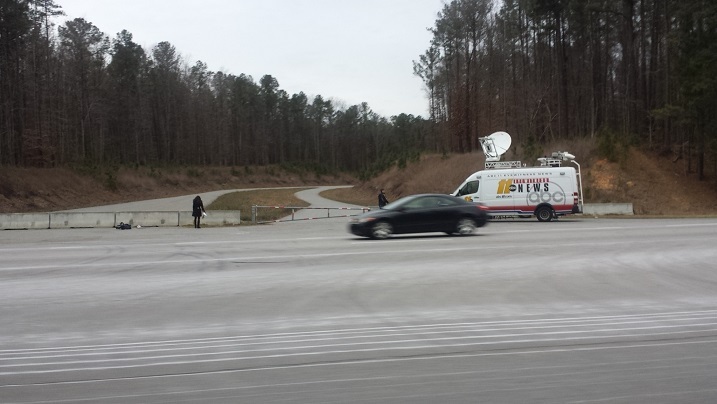 Telapost and ABC11 News reporting on the possible future Wegmans location. And here is their report! The Cary Wegmans was also mentioned on WRAL and several other news websites, with the best coverage coming from Amanda Hoyle at Triangle Business Journal. People in the Facebook Community “Bring Wegmans to the NC Triangle Area – Please” rejoiced. Where will the Cary Wegmans be located? 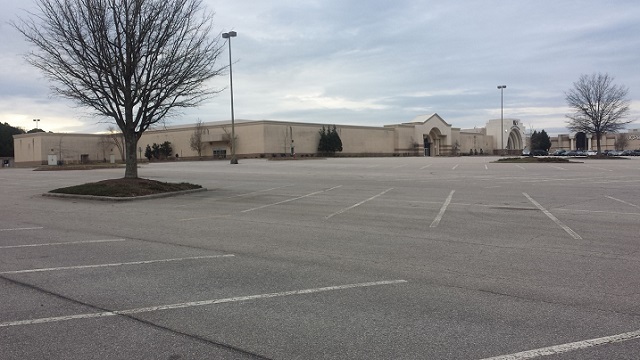 The new Wegmans will be located on Cary Towne Boulevard near the dying Cary Towne Center mall. The un-busy Cary Town Center mall looking rather lonely. 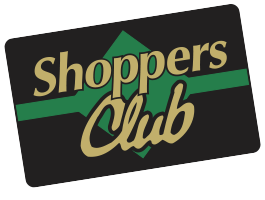 Got a club card? The card (and app!) comes with some great benefits, all which are available to see on the Wegmans website. Some of the benefits include great savings, coupons, check cashing, mailings, the ability to save shopping lists, view past purchases, and manage prescriptions. Compare this to a Food Lion card which is essentially a piece of plastic taking up space in your wallet. What do you like the best about Wegmans? My fingers are tired. Tell the world what you like about Wegmans now! It does appear that most stores do cater to local markets with items which are popular locally. So… Maybe we’ll get some Cheerwine! Great article and spot on. We also moved to Cary from Rochester, NY 17 years ago. We’re excited to FINALLY be getting Wegmans!! (…and yes, lots of country folk in NY State too). … what I like… Best customer service you’ll ever find in a grocery store! I am from Rochester NY I’ve been here for 4 years now and I cannot wait for Wegmans to open. We will finally have good French bread in NC. I am so excited. I am from Rochester, NY. Moved here 5 years ago. Wegmans is a must have. I miss so much about that store I couldn’t begin to list it all. From the pizza, to the bulk section, to wegmans brand products, bakery…the list goes on… I am so excited about this!!! Wegmans has their own warehouses and also controls their distribution process without outsourcing it, which is interesting. I like them as they really were a pioneer in the fresh / local food scene. They will fit in well in Cary. I always shopped at the Wegman’s in Auburn, NY. Fantastic bakery, the best birthday cakes ever and the best of all, Danny Wegmans’ commitment to sourcing locally produced produce to support local farmers. In comparison, the Auburn Wegman’s is smaller, and the Dewitt, NY store is ginormous! Anyone who is lucky enough to have a store near them is blessed. I live in NE Florida and have no hope of seeing one here anytime soon. Originally from Buffalo, now in Greensboro. Boy do I miss my Wegmans!!!! I hope they have Sahlens hot dogs!!!!!! Wegmans here in Northern Va is not only my favorite grocery store. It’s my favorite store period! Can’t wait for the Cary one to open for my parents who live there. Every time they come visit we have to go to Wegmans! !